The Indian toy market is currently valued at Rs 2000 crore growing at a CAGR of 15 per cent. 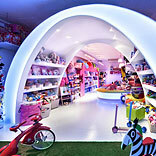 The growth trajectory is all set to increase with the advent of international toy retailers and also due to the Indian retailers allocating a large share of store space to the toys category. Fuelled by video, console and computer games, the industry is also benefiting from a growing adult consumer base as this group takes a great interest in games as a popular leisure pursuit. This is a market that caters to consumers who want to buy everything you have, don’t care what the cost is and are less than five feet tall. Innovations and creativity are the key to survival in this industry, selling toys isn’t exactly a child’s play − you need a lot more than super-hero characters to survive. In recent years the market has been influenced by changing consumer tastes, with children opting for more sophisticated video games and electronic toys. Children are also becoming increasingly accustomed to changing toys more frequently. This means toy and game manufacturers are obliged to introduce new products on a regular basis, and focus on innovation and technological advancements. “Toy industry is coming out of a nascent stage and is increasingly becoming a sought after category for both customers and retailers alike,” said Prasanna Nagarjan, Category Manager for toys, Crossword. Only 35 per cent of the Indian toy market is organized and companies like Simba and Hamleys are hoping to create a niche in the branded toy space in India which is otherwise dominated by imports from China. Also, with the business environment for foreign retail getting conducive in India (100 per cent FDI in single brand retail); companies are hoping to expand their presence in the country. vendors overseas. This is also one of the main reasons for our phenomenal success in the toys category,” said Nagarjan. story is limited exposure to smaller cities. The Indian toy industry caters to about four crore kids in the age group of 12 years across the country. But domestically manufactured toys account for only 15 per cent of the market and the rest of it is flooded with imported toys from countries like China, Korea, Malaysia, UK and the US. The small toy shops fulfill the demand of the masses, and the branded ones such as FisherPrice, Funskool, Hamleys, Lego and Mattel fulfill the demand of the middle and high-class. The Indian cities such as Ahmedabad, Bangalore, Hyderabad and Pune are fast-emerging as toy production hubs. The toy industry employs almost 25 lakh people both in the organised and unorganised sector. Almost 70 per cent of the toy market in India is unorganised. Since technical knowledge is fragmented, Indian toy industry struggles to produce volumes for a globally competitive pricing. In spite of huge demand the sector still remains largely unorganized. Dogged by lack of innovation, marketing, advertising, distribution and abundance of imported products, the domestic toy industry must be provided with credit and marketing assistance by the Government. From 2000 players a few years ago, barely 800 survive today. It is believed that nearly 40 percent of toy companies have shut shops since Chinese products started flooding into Indian market. Although the unorganized sector has been hit the most, players like Mattel, Funskool and a few others have been forced to fight back with strings of innovative strategies. The pester power of kids and the increased ability to indulge into impulse purchase are important factors driving the market. Today the story behind each toy and the ability to customize it for the market keeps the brand afloat in the competition. According to a Euromonitor study, spending on toys and games in India is set to grow at 157 per cent between 2009 and 2014, much faster than other Asian countries such as China (84%), Taiwan (35%), South Korea (33.1%) and Singapore (17.2%). The Indian toy market is on its way to becoming one of the most advanced industries in the subcontinent.